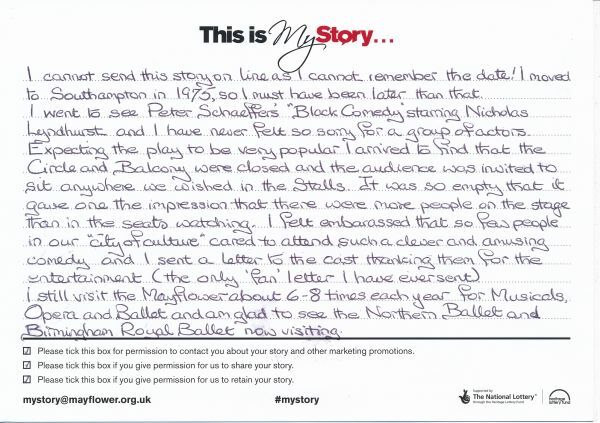 My Story Card: Pauline Richards remembers coming to the theatre for the first time in the 1970's. I cannot send this story online as I cannot remember the date! I moved to Southampton in 1975, so I must have been later than that I went to see Peter Schaeffers' "Black Comedy" starring Nicholas Lyndhurst and I have never felt so sorry for a group of actors. Expecting the play to be very popular I arrived to find that the Circle and Balcony were closed and the audience was invited to sit anywhere we wished in the stalls. It was so empty that it gave one the impression that there were more people on the stage than in the seats watching. I felt embrassed that so few people in our "city of culture" cared to attend such a clever and amusing comedy and I sent a letter to the cast thanking them for the entertainment (the only 'fan' latter I have ever sent) I still visit the Mayflower about 6-8 times each year for Musicals, Opera and Ballet and am glad to see the Northern Ballet and Birmingham Royal Ballet now visiting.